Looking for naval weapons, navigation, or safety solutions? ASK NORTH AMERICA at ExpoNaval 2018. 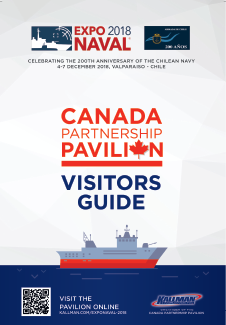 Among the many reasons to had visit ExpoNaval 2018 in Chile this December, the USA and Canada Partnership Pavilions featured North America's most innovative partners, products, equipment and services. 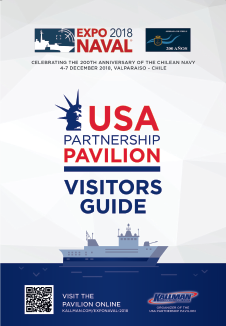 Visitor where able to meet all of the American suppliers who can help gain a competitive advantage in any market sector anywhere in the world. Come back often to check the latest industry headlines from our media partners and read through the Exhibitor Spotlights below. AeroVironment is a global leader in the design and manufacturing of small Unmanned Aircraft System solutions (Raven, Puma AE and Wasp AE) for both military and commercial applications. Belleville Boot Company and Tactical Research, Military and Public Safety footwear since 1904. Belleville Boot Company and Tactical Research, Calzados Militares y Seguridad Publica desde 1904. Harris Corporation is a leading technology innovator, solving customers’ toughest mission-critical challenges by providing solutions that connect, inform and protect. Harris supports government and commercial customers in more than 100 countries. Harris es un innovador de tecnología líder, que resuelve los desafíos de misión crítica más difíciles de los clientes al proporcionar soluciones que conectan, informan y protegen. Harris apoya a clientes gubernamentales y comerciales. Belleville Boot Company, manufacture of military and public defence boots since 1904. Belleville Boot Company fabricante de calzados militares y defensa publica desde 1904. Metal Shark is a leading designer and builder of custom vessels for the U.S. & International militaries. Metal Shark offers a complete portfolio of globally-proven aluminum, steel, and composite vessels ranging from 16’ to over 300’ in length. Metal Shark es un diseñador y constructor líder de embarcaciones para las fuerzas militares estadounidenses e internacionales. Metal Shark ofrece una gama de embarcaciones en aluminio, acero y compuestos comprobados desde 16' a más de 300' de eslora. 6814 East Admiral Doyle Dr.
SynQor is a leading supplier of power conversion solutions to the military market. SynQor’s innovative products are designed for today’s leading-edge power infrastructure hardware. SynQor es un proveedor líder de soluciones de conversión de energía para el mercado militar. Los productos innovadores de SynQor están diseñados para el hardware de infraestructura de energía de vanguardia de hoy. General Dynamics Mission Systems–Canada, an established defense and security technology company, has a history of over 70 years of specializing in Underwater Warfare solutions for our Naval Surface and Aviation customers around the world. General Dynamics Mission Systems–Canada, una empresa de tecnología en defensa y seguridad enraizado, cuenta con una historia de 70 años de especialización en soluciones de Guerra Submarina clientes de Superficie Naval y Aviación alrededor del mundo. L3 develops advanced defense technologies and commercial solutions in pilot training, aviation security, night vision and EO/IR, weapons, maritime systems and space.